Many foreigners who come to China work as English teachers. Some are very qualified and love teaching, and others… just have a white face. As I mentioned a couple of posts ago, a lot of Chinese people automatically think that all foreigners are English teachers. This causes that, unfortunately, some English teachers in China are people who don’t care about providing a good education to their students, at all. This is partly what this novel is about. Thomas Guillard is an old man who moves to a small town in rural Hunan and starts working in the high school there. He is a mess of a person, drinks too much all the time, and doesn’t give a damn about his lessons or the students. Daniel is a young guy who has worked at that same high school for some time. He is idealistic and passionate, but also feels some doubts in his heart. Is teaching what he wants to do for the rest of his life? 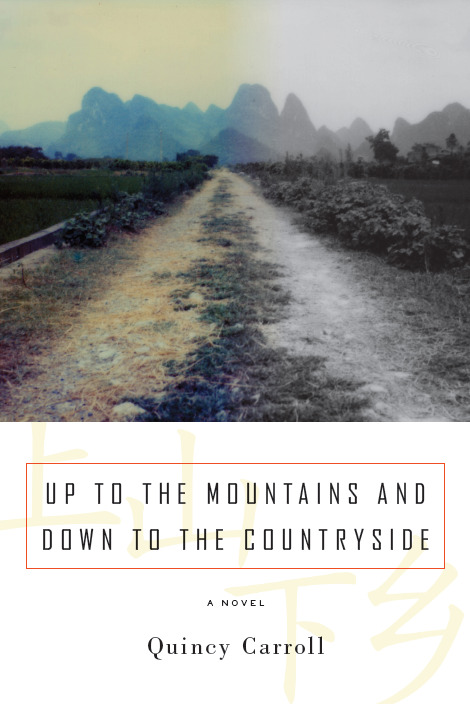 Up to the mountains and down to the countryside is Quincy Carroll’s first novel. He is an American man who taught in Hunan province for several years and wrote this novel based on what he encountered there. I like reading stories of other foreigners in China because everyone has different experiences but there are always similarities. However, I didn’t find many similarities with this one! For two main reasons: I have never lived in rural China, and it has to be completely different from living in a city. Also, I have never been a teacher. I’ve heard lots about it, of course, but didn’t experience it first hand. So at first I had a hard time with the two main characters in the book: one is so bad, in all aspects, and the other is so naive, that they seemed too forced of a caricature. Especially for the character of Thomas Guillard, the antagonist, I thought that no one can be so mean, so selfish, so uncaring and without any positive trait at all. He’s like a cartoon villain! But then I thought that there really are a lot of detestable expats in China, so he acts like a mishmash of all the bad traits you can find in foreigners here. Daniel is also not without guilt. He is supposed to be the “hero”, but I didn’t like him too much. He seemed too self-righteous. There is also a third main character: Bella, a Chinese student. She is the typical Chinese good student, obsessed with getting the best grades and dreaming about attending university in the US. She is the closest student to both teachers (because she wants to practise her English at all times) and ends up having a decisive part in the story. The characters were not the kind of people I would befriend in real life, but that doesn’t mean I didn’t enjoy the book. I specially liked the descriptions about what it is to live in rural China and the interactions with the local people. I also liked the confirmation that many foreigners feel that their life in China is not “the real life”, that it is like some kind of bubble. I have been here for more than 8 years and I still feel like that! If you want to read the book, you can purchase it through Amazon! You can also read an interview with the author in Speaking of China. Nice review, Marta. I really agree with this sentence you wrote: “The characters were not the kind of people I would befriend in real life, but that doesn’t mean I didn’t enjoy the book.” I felt the same way too. I probably wouldn’t be friends with most of the people in the book either, but I thought it was a good read all the same. BTW, thanks so much for the link back to my site! I’m glad we agree! To be honest I have never met an expat as nasty as Thomas, but I have heard they exist. I’ve been lucky, haha. It’s a bummer that the characters are so one dimensional, but thanks for posting a review. I always enjoy your posts Marta and this one is good too; sounds an interesting book but on this occasion not one I will buy as I have so many others to read and some of them you had recommended. Hope you are having a lovely weekend. Nice review. Love the brutal honesty. I saw a blurb about this book somewhere a while ago and thought either the book would be really good or just like you reviewed. English teaching in China as a premise for a book is a difficult thing to pull off (River Town, a solid book, does it well but even that book is like reading a time capsule of a China that doesn’t exist any more [1990’s], even in the countryside). Thanks for the heads up! I’m not really interested in reading a book with an FBH (failure back home) as an antagonist. I have to interact with enough of those people at the bars and restaurants of Suzhou. I’ve had my fill. Now, if he was a secondary character who gets beat up by a pimp, arrested for solicitation of a lady of the night and deported…that’s the type of character I wouldn’t mind seeing in a novel. The antagonist in this book does have something bad happening to him, if that makes you happy, haha. I don’t know any FBHs but to be honest I basically know no expats in Suzhou hahaha. I think no matter how many years you live away from your birth country it always feels like living in some kind of bubble. This is my 11th year being an ex pat and it still doesn’t feel like real life! I’m adding this to my list of books to read too, it’s definitely a common situation, I’ve heard about it loads before. Is this a true story? The author lived and taught in the town where the action takes place, but the characters are not real people, I think he created them based on several different people. I just read this book too and I thought it was quite good. I liked that it didn’t romanticize anything and that the “good guy” Daniel had a lot of doubts himself. Though I thought it would have been better if Guillard had had a little more background about how he turned out to be so cynical. I can’t imagine living in a part of China like that myself.